Delayed enhancement MRI (DE-MRI) has been established as a diagnostic imaging standard for myocardial viability assessment. The current reference standard for DE-MRI uses an inversion-recovery 2D gradient echo sequence to acquire images during repetitive breath-holds. This breath-hold 2D (2DBH) technique requires significant patient cooperation and suffers from potential slice misregistration due to diaphragmatic excursions in different breath-holds. To overcome these limitations, navigator-gated 3D (3DNAV) DE-MRI has been developed using a diaphragmatic navigator to monitor respiratory motion and adjust data acquisition accordingly. Previous 3DNAV sequences employed the accept/reject gating algorithm with a fixed gating window which can lead to long imaging time in the case of a steady diaphragmatic drift. The objective of this study was to develop a rapid and accurate free-breathing 3DNAV DE-MRI sequence using the drift-resistant phase ordering with automatic window selection (PAWS) gating algorithm and to evaluate its feasibility in routine clinical imaging with 2DBH DE-MRI as the reference standard. The developed 3DNAV sequence combined 3D partial k-space acquisition with an efficient 2-bin PAWS real-time navigator gating algorithm to reduce scan time. PAWS automatically selects a gating window at the most likely diaphragmatic position even in the case of respiratory drift and reduces residual motion artifacts within the gating window through view ordering. The 3DNAV sequence was incorporated into a routine cardiac MRI protocol on a 1.5 T GE clinical scanner and imaging was performed in 22 patients (10 men, mean age of 50 ± 19 years). 2DBH DE-MRI was initiated 10 min after contrast administration (0.2 mmol/kg) and followed by free-breathing 3DNAV DE-MRI. The typical imaging parameters were: 1) 2DBH: TR/TE/FA/rBW = 7.0 ms/3.4 ms/20°/± 31.25 kHz, 256 × 192 matrix, slice = 6 mm/4 mm skip, 24 views per segment, 2RR; 2) 3DNAV: TR/TE/FA/rBW = 4.8 ms/1.5 ms/20°/± 62.5 kHz, 256 × 256 matrix, slice = 5 mm, partial NEX = 0.75, partial kz factor = 0.75, 36 views per segment, 1RR, 4 mm gating window. A subject-specific inversion time was used to null the viable myocardium. Qualitative comparison was performed independently by three readers using three criteria: 1) image quality score (0 = nondiagnostic, 1 = poor, 2 = fair, 3 = good, 4 = excellent), 2) diagnostic outcome with regard to the presence of myocardial infarct, 3) relative diagnostic confidence score in the case of same outcomes. Quantitative comparison was performed in patients with hyperenhanced myocardium using three criteria: 1) infarct volume, 2) infarct signal-to-noise ratio (SNRinf), 3) infarct-viable myocardium contrast-to-noise ratio (CNRinf-myo). (Table 1). 3DNAV imaging was completed successfully in all subjects. Hyperenhancement was observed in 8 patients, all of whom had corresponding areas of hyperenhancement on 2DBH images. In one patient, the tracing of infarct from 2DBH images could not be performed due to excessive motion artifacts. Fig. 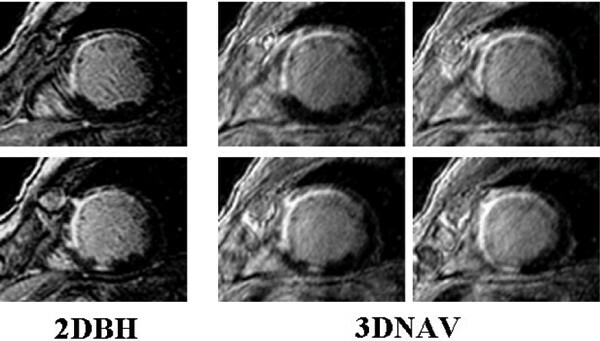 1 provides an example of concordant 2DBH and 3DNAV DE-MRI images depicting very similar infarct shapes. Fig. 2 demonstrates the superior diagnostic utility of 3DNAV technique in an uncooperative patient. This study evaluated the feasibility of a rapid free-breathing 3D delayed enhancement imaging sequence with breath-hold 2D imaging as the reference standard. 3D imaging provided improved image quality and similar infarct detection in less scan time compared to 2D imaging. While both techniques provided the same clinical diagnoses for viability assessment, 3DNAV DE-MRI provided slightly better average image quality and better relative diagnostic confidence score than 2DBH DE-MRI due to the improved SNR and contiguous coverage of the ventricle. 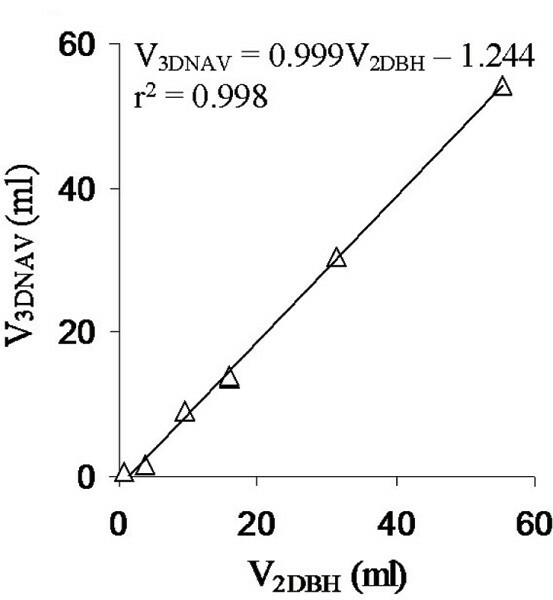 Compared to 2DBH imaging, 3DNAV imaging yielded a 79% increase in SNRinf and a 90% increase in CNRinf-myo, and reduced total scan time required for viability imaging by 39%. Fig. 3 demonstrates the close correlation between infarct volumes measured from 2DBH and 3DNAV images over a large range of infarct sizes. Free-breathing navigator-gated 3D DE-MRI viability assessment is feasible and provides a similar infarct detection rate with better diagnostic confidence in shorter scan time compared to the standard breath-hold 2D DE-MRI.